Reading during the summer is essential, as the vast majority of parents and children know. Yet still, many students only read a handful of books during this 3 month break. The result is that they lose many of the gains they've made during the school year. This impacts students across the board, but has a especially significant impact on low-income students. Listening to professionally narrated audiobooks is a great way to prevent the “summer slide.” In this edWeb webinar, I will present research findings from a 2016 study looking at the effect of adding a listening component to literacy instruction—in school and at home. I will specifically address its impact on student vocabulary, reading comprehension and motivation to read. I will put this in a broader context of reading develop, examining reasons why listening comprehension is key to developing strong readers. I will also share my experience watching students use audiobooks on a regular basis and consider the importance of providing year-round digital access to audiobooks. Finally, I will share recommendations of some of our favorite audiobooks for summer listening. This live, interactive session is designed for PreK-12 librarians as well as reading coaches, ELL specialists/teachers, Title I teachers and administrators, district librarians, and classroom teachers. Join us to learn how to prevent the summer slide with audiobooks! The sun shone brilliantly on today, making me wish I were out in the garden. My children loved digging in the dirt when they were young. Is that something you enjoy doing with your kids? Check out these favorite picture books to share about gardening, and share your excitement with your children. All feature a diverse range of kids. Several are new in paperback this spring. The review copies were kindly sent by the publishers, Candlewick, Charlesbridge and Chronicle. If you make a purchase using the Amazon links on this site, a small portion goes to Great Kid Books. Thank you for your support. 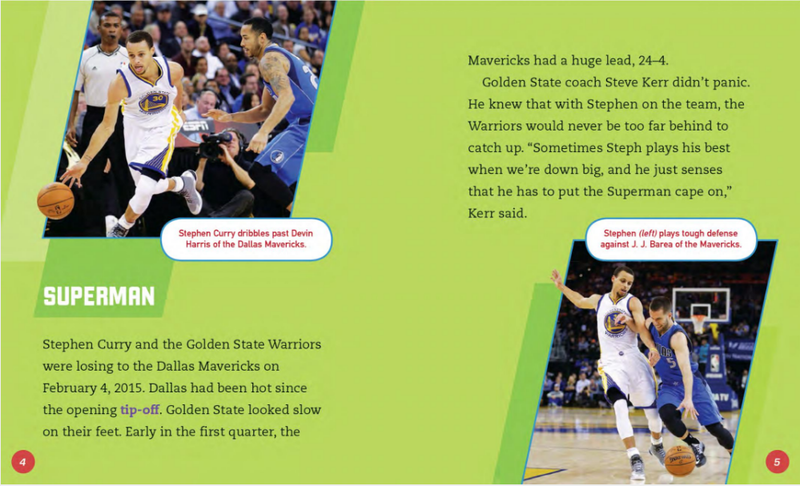 With NBA basketball playoffs in full swing, you may want to build on young fans' excitement with these biographies of our local favorite star Steph Curry. When my students choose sports books for themselves, I really encourage them to look inside and see if the text seems right for them. Here are three books that work well for developing readers--shared from easier to more difficult. Stephen Curry (Pebble Plus Famous Athletes), by Mari Schuh, is a great choice for beginning readers, with simple text and just three or four short sentences per page. Our first graders can read many (but not all) of this, and our second graders are finding it perfect for this time of year. 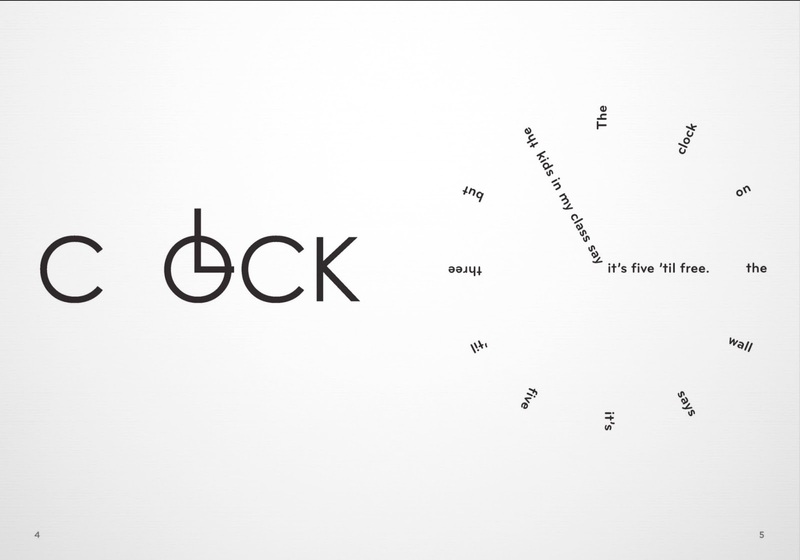 The font is large and the background is plain, helping young readers focus on each word. The information is limited, so readers may leave this wanting to read more. See preview at Google Books. "Basketball star Stephen Curry was born March 14, 1988. He grew up watching and playing basketball. His dad played in the NBA. Stephen watched his dad's games." Amazing Athletes is a very popular series with our 2nd & 3rd graders, and they love this Stephen Curry book by Jon Fishman. As you can see in the sample below, this is written with fuller paragraphs. The layout and design make this easy for readers who are developing confidence to tackle. Full color photographs and captions complement the exciting text. 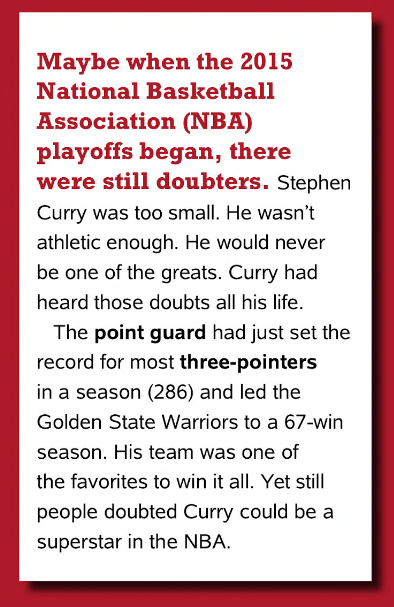 This biography focuses more on his early years & college playing than Curry's difficult beginning of his pro career. "Stephen Curry and the Golden State Warriors were losing to the Dallas Mavericks on February 4, 2015. Dallas had been hot since the opening tip-off... Golden State coach Steve Kerr didn't panic. He knew that with Stephen on the team, the Warriors would never be too far behind to catch up." For readers ready to learn more about Curry's career and training style, search out Stephen Curry (Sports All-Stars), by Eric Braun. With more complex sentences and longer paragraphs, this biography works best with confident readers in 3rd or 4th grade. Just look at its opening. The writing is engaging, but definitely more complicated than the other two books. "Maybe when the 2015 National Basketball Association (NBA) playoffs began, there were still doubters. Stephen Curry was too small. He wasn't athletic enough. He would never be one of the greats. Curry had heard those doubts all his life." I especially found it interesting to read about Curry's practice techniques. When he was recovering from multiple injuries, Curry started trying unusual training methods to help him improve his ball handling and focus. "Many fans have seen Curry dribble two basketballs at once before games. The ritual is about more than improving his skills or giving fans a good show... This kind of practice mimics what a point guard has to do during a game--dribble, watch the defenders, set up a play, and more--all at the same time." Supporting readers along their road to reading is especially important. 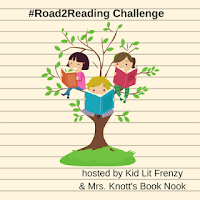 This post has been inspired by my friends Alyson Beecher and Michele Knott, whose weekly series #Road2Reading celebrates books for early readers. The review copies for Sports All-Stars were kindly sent by the publisher, Lerner Books. The review copies of the Pebble Plus and the Amazing Athletes books came from our school library. If you make a purchase using the Amazon links on this site, a small portion goes to Great Kid Books. Thank you for your support. Empathy -- it's a vital quality to develop for all of us. How do we reach outside of ourselves to imagine being in someone else's shoes? How do we take someone else's perspective? Misuzu Kaneko's beautiful poetry is a shining example of how poetry can help us stop for a moment and think about the world from a different point of view. This striking collaboration shares the story of how Misuzu Kaneko's poetry came to be discovered long after her death; moreover, it brings her poems to an English-speaking audience for the first time. In 1966, a young Japanese poet discovered a poem that struck him with its empathy and simplicity, yet he could find no other poems by this author -- who was she? Did she write other poems? Linger for a moment on this poem, and ask young readers to think about this poet's message. Why would the fish hold funerals? How does this shift readers' thinking? Although Setsuo Yazaki began searching in 1966, it wasn't until 1982 that the curious poet uncovered more of Misuzu's poetry. Her brother still had her diaries, which contained the only copies of her poems that still remained. Finally, Setsuo began to discover more about Misuzu's life. Born in 1903, Misuzu lived in a small fishing village in western Japan where her mother managed a bookstore. "To Misuzu, everything was alive, and had its own feelings." 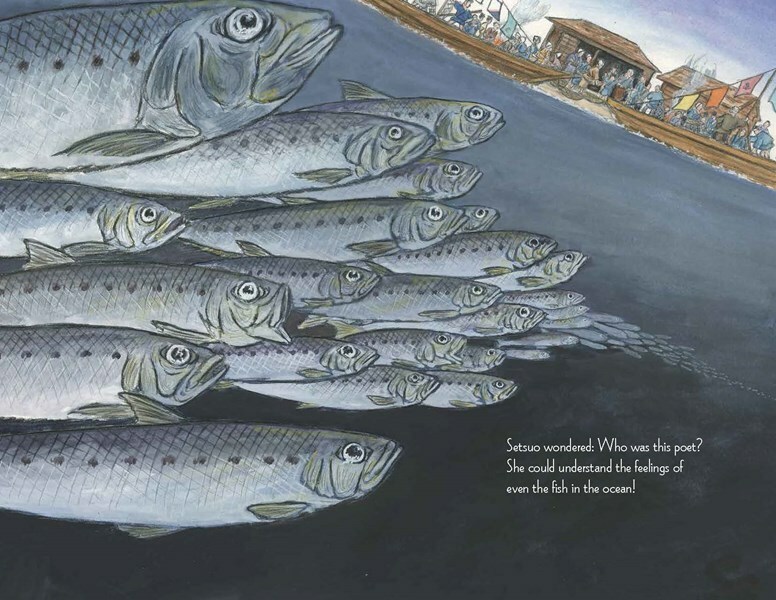 Her wonder and curiosity encourages young readers to think about the natural world with fresh perspective. 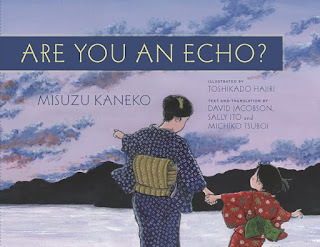 By interspersing Misuzu's poems with the story of her life, the authors help young readers focus on the poet's work as well as her life. the cold moonlight piercing it." After a short, unhappy marriage, Misuzu took her own life at age 26 in 1930. Jacobson conveys her suicide sensitively and straightforwardly. I especially appreciate how this lets young readers feel empathy for Misuzu without sensationalizing her tragedy. 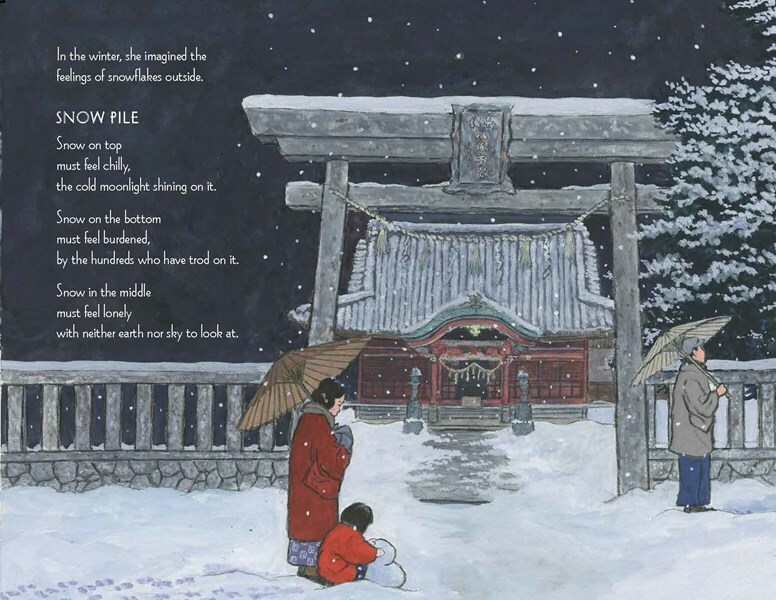 The second half of this picture book shares fifteen more of Misuzu's poems translated into English, along with their original Japanese versions. 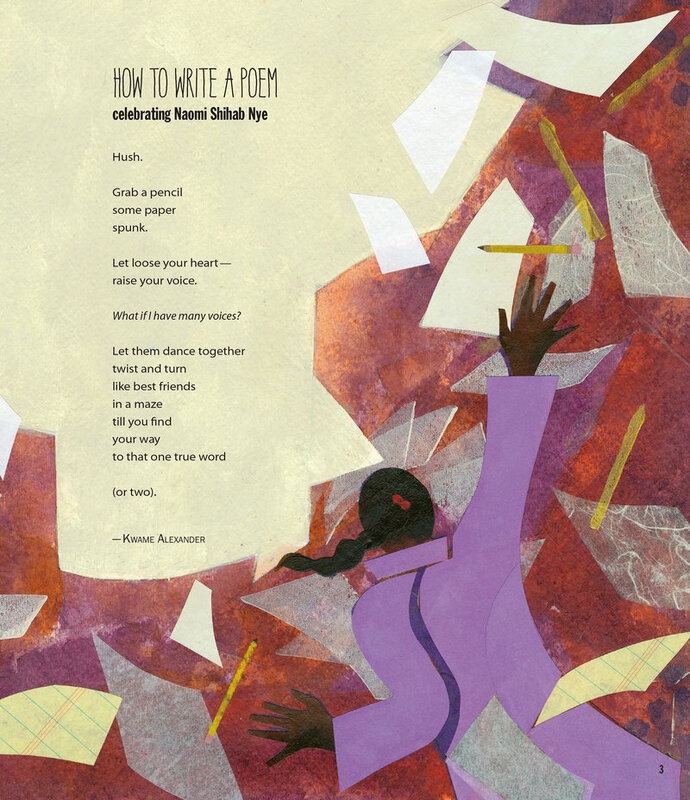 Children will enjoy lingering over poems; teachers will want to use them as mentor texts for children as they explore writing their own poetry. My own grandmother used to encourage me to think about different subjects in school as "mental gymnastics," helping me stretch and work my mind in new ways. I wonder if Misuzu's poetry might help us be more limber, more nimble in our emotional interactions with the world. Isn't that what empathy is at its root? 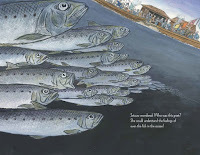 Many thanks to Betsy Bird for first bringing this unique picture book to my attention. 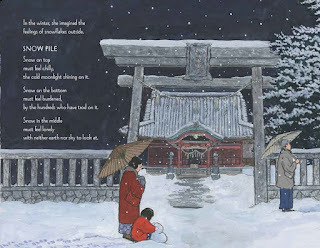 Illustrations © Toshikado Hajiri, narrative © David Jacobson, and translations © Sally Ito & Michiko Tsuboi, shared with permission from the publisher. The review copy was kindly sent by the publishers, Chin Music Press. If you make a purchase using the Amazon links on this site, a small portion goes to Great Kid Books. Thank you for your support. In our school district, Arabic is the third most common language spoken at home. I strive to share books with students that reflect their culture and heritage. 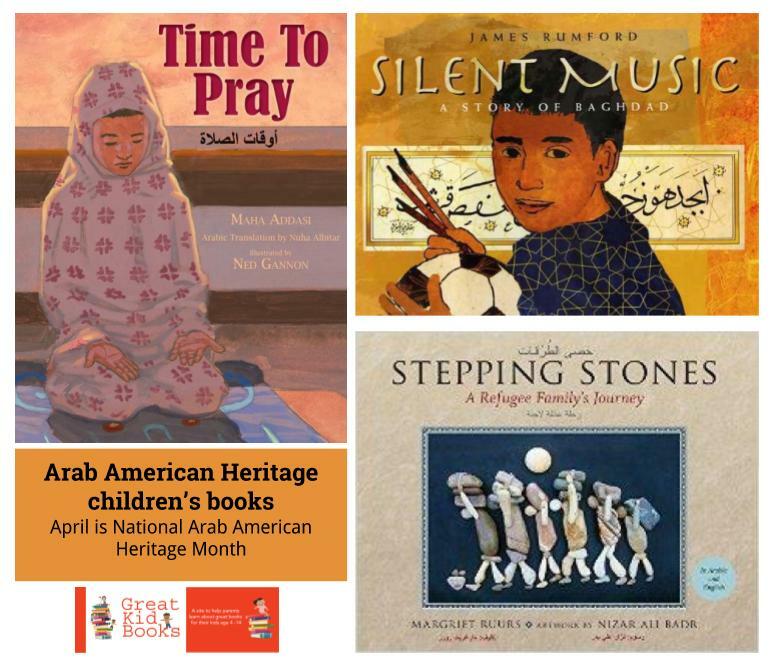 April is National Arab American Heritage Month and we celebrate this in our library by sharing books that reflect many experiences from the Arab world. These three bilingual picture books are especially beautiful and moving. In Silent Music: A Story of Baghdad, by James Rumford, Ali lives in modern Baghdad, loves playing soccer and dancing to loud music. Most of all, he loves the way it feels to practice calligraphy: "writing the letters of my language ... gliding and sweeping, leaping, dancing to the silent music in my head." This moving story tells of how Ali is inspired by the master calligrapher Yakut, who found solace practicing his art during times of war. "Each illustration is masterful, with Badr's placement of stones as careful as brush strokes, creating figures positioned to tell the whole story without the benefit of facial expressions: dancing, cradling, working; burdened, in danger, at peace." Time to Pray, by Maha Addasi, captures the experience of a young girl traveling from her suburban American home to visit her grandmother. On her first night, Yasmin is awakened by the muezzin at the nearby mosque calling the faithful to prayer. She is too tired to get up, but she watcher her grandmother prepare for prayer. This gentle story shows the bond that grows between Yasmin and her grandmother, and the special place that prayer and rituals have bringing them together. All review copies came from our school library collection. I want to send special thanks to our PTA and my colleague Zoe Williams for help selecting and developing our collection of books that honor the experience of Arab Americans. If you make a purchase using the Amazon links on this site, a small portion goes to Great Kid Books. Thank you for your support. Beginning to read is a daunting task -- kids and parents feel the pressure. Please know that sharing books together is the most important thing. Model reading, talk about books, invite your children to try with you. Above all, try to make it fun. That's why I love these two series of books for beginning readers--they're silly, they have good stories, and they use just a few words on each page. Otto is a lovable robot, trying to figure out how to get along here on Earth. 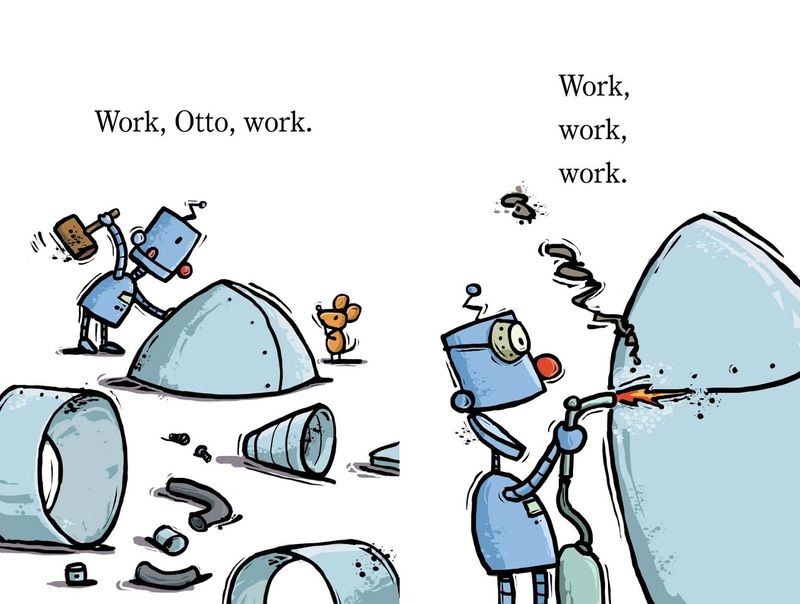 He tries to build a robot to fly home: "Work, Otto, work." Milgrim does a terrific job using only two or three words on a page to convey what's happening, with repetition that flows naturally. 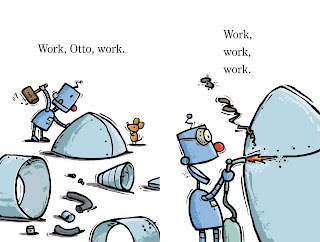 Otto always ends up getting in trouble, bringing lots of giggles to young readers. In Swing, Otto, Swing, he tries to fly from tree to tree like his monkey friends. Somehow, it's much harder than it looks. If you like the goofy adventures of Otto, you might also like Big Dog and Little Dog beginning readers by Dav Pilkey. These two goofy friends get into all sorts of mischief. Big Dog and Little Dog want to play, like any two friends. "But there is nothing to play with. What will they play with?" They start playing with the couch, but that soon turns into a game of tug-of-war. Uh, oh. They keep just getting into trouble! Pilkey uses simple sentences and bold drawings that move the action along. If you have a dog that's ever met a skunk, you'll laugh as these friends find out just how awful a skunk can smell. "Big Dog thinks it is a kitty. Sssssss. But it does not smell like a kitty." These relatable situations are perfect for young readers. I'm happy to join friends at Kid Lit Frenzy and Mrs. Knott's Bookshelf in celebrating the #Road2Reading. As they write, "All journeys have a starting place. 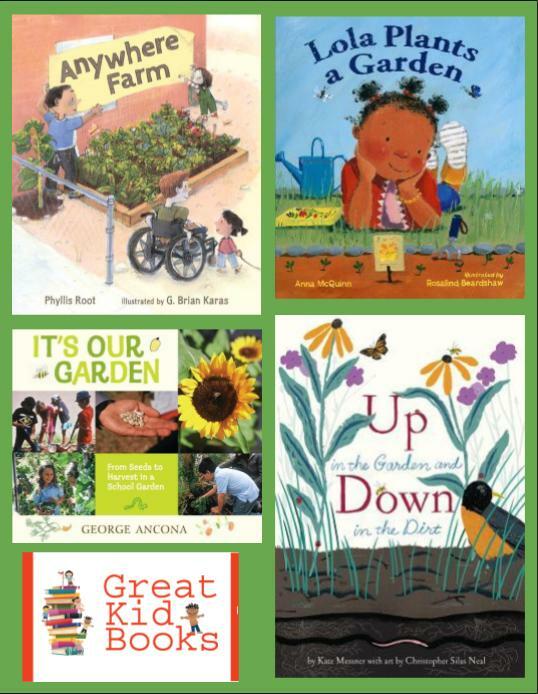 This is a weekly place to find books and tools that you may use with readers at the start of their reading journey." The review copies for The Adventures of Otto were kindly sent by the publisher, Simon & Schuster. The review copies of Big Dog and Little Dog came from my home library. If you make a purchase using the Amazon links on this site, a small portion goes to Great Kid Books. Thank you for your support. As Kwame Alexander writes in his preface, poetry can pack a powerful punch, touching our deepest feelings, helping us notice everyday details in new ways. In this dynamic collection, Alexander and fellow poets Colderley and Wentworth honor 20 of their favorite poets. Their original poems dance and spin with the poets they admire, inviting readers join the celebration. Every page radiates with life, love and joy, as Alexander, Colderley and Wentworth pay tribute to their favorite poets, ranging from Rumi to Emily Dickinson to Maya Angelou. 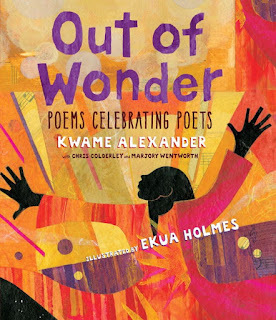 By selecting such a wide range of poets, they provide many ways in for young readers. There is no one right way to write or read a poem, and this collection lets us find different entry points, "stepping-stones" to wonder, to read, to write. Alexander begins with "How to Write a Poem," celebrating Naomi Shihab Nye, asking readers to "let loose your heart -- raise your voice." He introduces the metaphor of dance, suggesting that a poet's many voices dance together to find their inner truth. "How to Write a Poem"
Some young readers may want to emulate poems that notice the details in everyday life. Wentworth spins memories of early morning routines in her poem celebrating Billy Collins: "When you first wake up, notice / how your mother's voice, calling / you to breakfast, sounds like a fire alarm." Colderley celebrates Basho with "Contemporary Haiku:"
Ekua Holmes' mixed-media illustrations bring each poem to a new level, adding her own deep, resonate colors and images, inviting readers to pause and wonder and stay awhile on each page. Enjoy listening to this radio interview with Kwame Alexander on NPR. As he says, "I think poetry is a way of helping us at least begin to understand ourselves better and eventually each other." Alexander is definitely a "hopeful romantic," spreading his joy and love of life with readers everywhere. For that, I am truly grateful. Illustrations © Ekua Holmes 2017, poetry © Kwame Alexander, Chris Colderley and Marjory Wentworth 2017, shared with permission from the publisher. The review copy was kindly sent by the publishers, Candlewick Press. If you make a purchase using the Amazon links on this site, a small portion goes to Great Kid Books. Thank you for your support. I love sharing the way poets play with words to make us laugh, think and look at things in a new way. 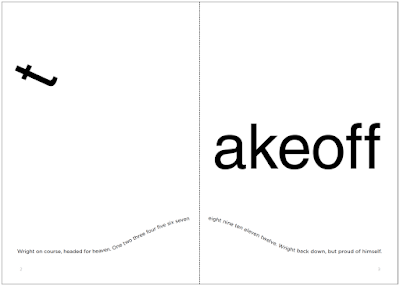 My students especially respond to concrete poetry, where the words are arranged to create images. Wet Cement is an outstanding, fresh collection of concrete poems, definitely worth seeking out. Bob Raczka writes that poems are like "word paintings," using words to create pictures in our minds. 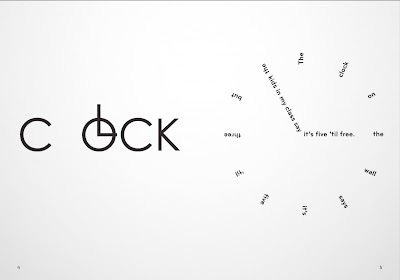 Concrete poems takes this a step further, creating a visual art form with words. 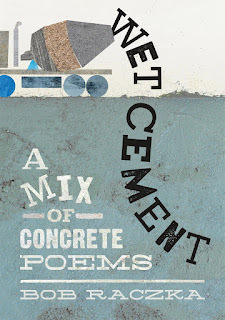 "In concrete poems, or shape poems...the poet arranges words in the shape of the thing the poem is about or in a way that emphasizes the poem's meaning." the kids in my class say it's five 'til free." Raczka's wordplay is accessible and inventive, inviting readers to think of words, letters and shapes in a fresh new way. As students what they thing the "t" in "takeoff" is doing all by itself on the page--what does it make them think about? And why did Raczka choose the phrase "Wright on course"? "Wright on course, headed for heaven. 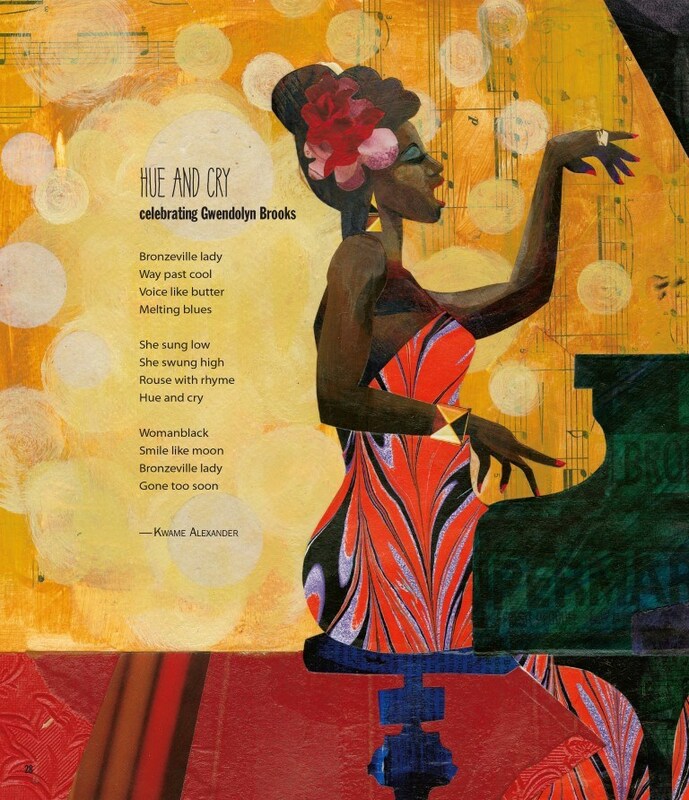 One two three four five..."
These poems give us a moment to play with text, to think about how words create visual art and to laugh at the inventive ways we can arrange words and letters on a page. I love the idea of turning this over to kids, asking them to see how they might play with letters and words to create different shapes. After all, as Raczka shows us, the word "try" is certainly embedded in the word "poetry." The review copy was kindly sent by the publisher, Roaring Brook / Macmillan. If you make a purchase using the Amazon links on this site, a small portion goes to Great Kid Books. Thank you for your support. Our students have been eagerly reading A Boy Called Bat, drawn in by the adorable cover. Many students relate to the bond that Bat feels for the baby skunk, but it is about much more. I love how this quiet book shows how a pet can help children form relationships, take responsibility and feel a sense of empathy. 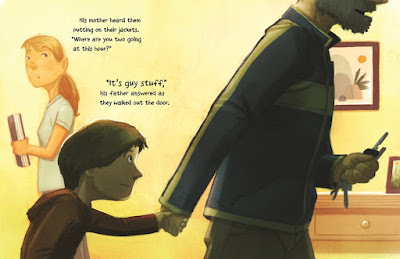 Even more so, I love how it shares the story of an autistic boy whose neurodiversity is just part of who he is. Third-grader Bat got his nickname because it's his initials; his full name is Bixby Alexander Tam. Like his namesake, Bat has super-sensitive hearing. Also, he sometimes flaps his hands when he's nervous or excited. Adult readers may recognize that Bat is on the autism spectrum, but this is not labeled--rather, just part of his character. Bat knows more than anyone in his class about animals. He loves reading his animal encyclopedia and wants to be a veterinarian when he grows up, just like his mom. He is observant and notices a lot of details. He is great at a lot of things, but Bat is not great at making friends. When his mom brings home a newborn skunk, Bat immediately connects to the kit and eagerly takes care of it. Soon, he's determined to prove that he's responsible enough to keep it as a pet. "A nose peeked out--a tiny pink nose--and then two slanted-closed eyes, a forehead covered in downy fuzz, little ears still curled tight against its head.... 'It's a kit,' Bat said, enchanted by the tiny creature, wanting so badly to hold it. 'A baby skunk.'" Bat struggles at home, especially with his parents divorce. The disruption in his routine when he has to spend the weekend at his dad's is very hard for Bat, especially being away from his new pet. And he struggles making friends at school. Elana Arnold develops his character in a sensitive, thoughtful way--helping readers see the nuances without labels or stereotypes. 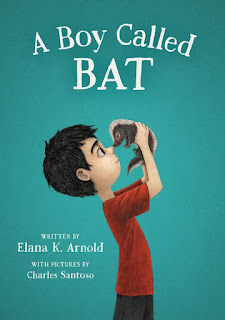 A Boy Called Bat would make a terrific read-aloud at home or school. It would lead to some heart-felt conversations about how people react to things differently. An excellent educator's guide is available to download for free. Elizabeth Bartmess, a writer and autistic advocate, reviewed this guide. I especially like the way it helps readers think about Bat's character. I have already purchased several copies as gifts for friends. The review copy was kindly sent by the publisher, Walden Pond Press / HarperCollins. If you make a purchase using the Amazon links on this site, a small portion goes to Great Kid Books. Thank you for your support. I've been thinking about courage lately, what it takes to face our fears and how we can help children when they feel overwhelmed. I've certainly felt completely afraid of both real and imagined things--sometimes so that I could hardly move. I love how Gennifer Choldenko's newest picture book, Dad and the Dinosaur, normalizes this fear, and lets us know that we can move forward. Nicholas is afraid of so many things, but his dad isn't afraid of anything. "Nicholas tried to be brave like his dad, but he needed help ... big help. He needed a dinosaur." This small toy dinosaur travels everywhere with Nicholas, in his pocket, tied to his swimsuit, tucked inside his soccer socks. "But no worries. Nicholas had his dinosaur and his dinosaur was fearless. 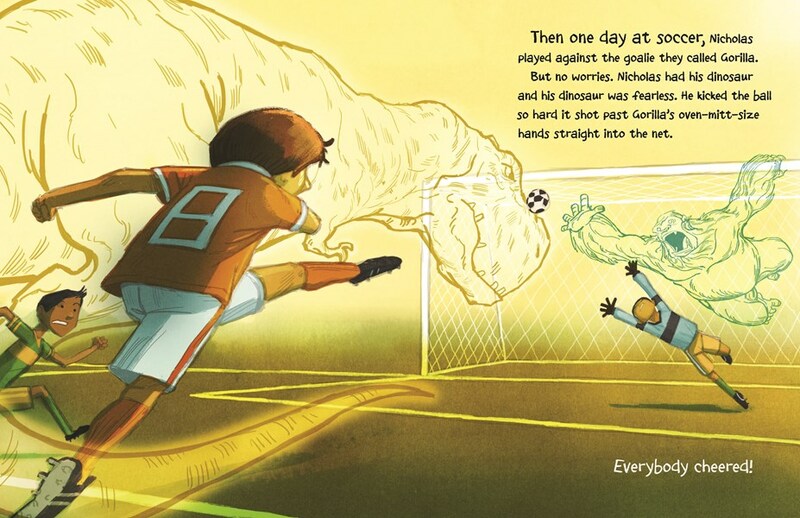 He kicked the ball so hard it shot past Gorilla's oven-mitt-size hands straight into the net." Part of me expected the story to take the "tough love" approach when Nicholas loses his dinosaur. As an adult, I know that he really has the courage inside him to survive without his toy. And yet, Choldenko takes a different route--showing how accepting and supportive his dad is. 'It's guy stuff,' his father answered as they walked out the door." 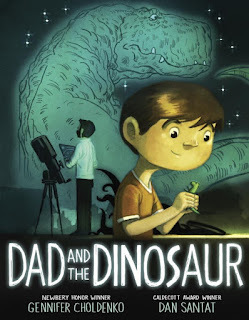 By taking his son to go find his dinosaur, Nicholas's dad sends the message that he believes in him. This acknowledges the child's reality and lets him overcome his fear in his own way. Best of all, it creates a bond between father and son, a trust that will help Nicholas keep finding courage in his own way. Santat's illustrations seamlessly move between the real and the imaginary, showing the dinosaur as part of both in a very real way. Young readers will love the way the dinosaur looms larger than life, boosting Nicholas's courage. It will be fascinating having kids compare this new book to Santat's Caldecott winning The Adventures of Beekle. The review copy was kindly sent by the publisher, Penguin Random House. If you make a purchase using the Amazon links on this site, a small portion goes to Great Kid Books. Thank you for your support.